Emeline's second grade class takes a field trip to the circus. After the teacher, Mrs. Splinter, gives the class instructions on the proper behavior, the circus begins. Mrs. Splinter tells the class important information about everything they see at the circus icluding the elephants, tigers, acrobats, and even the clowns. In the meantime, Emeline gets out of her seat to buy some peanuts and an elephant picks her up to become part of the circus. 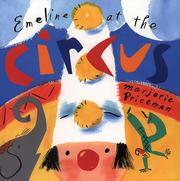 Priceman, Marjorie, “Emeline at the circus,” Children's Picture Book Database at Miami University, accessed April 24, 2019, https://dlp.lib.miamioh.edu/picturebook/items/show/6062.